Brewed to a generation-old recipe, MAXLRAINER SCHLOSS WEISSE is clearly darker in shade as was the custom for whole centuries. 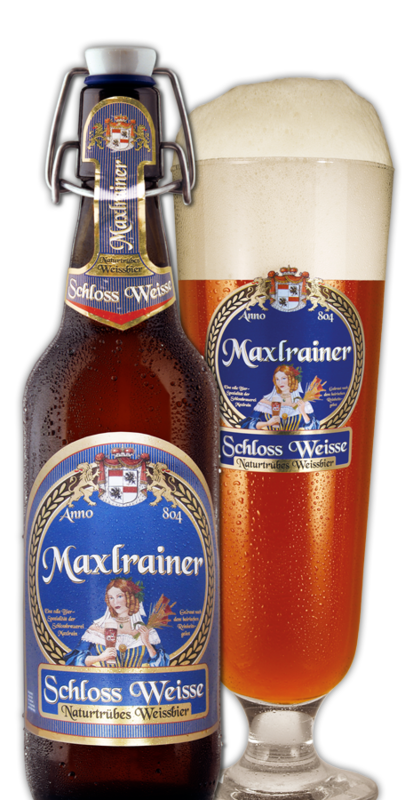 MAXLRAINER SCHLOSS WEISSE stands out on account of its incomparable full-bodied taste resulting from a choice selection of exquisite roasted malt varieties, fine aromatic hops and pure Maxlrain water. Brewed in strict compliance with the Bavarian Purity Law, MAXLRAINER SCHLOSS WEISSE develops its full aroma when poured out of the time-honoured swing-top closure bottle. This MAXLRAIN pale wheat beer speciality likewise has continued to enjoy pride of place in the DLG Gold Medal honours list for quite a number of years now.